©Smiley Burnette Interprises' main objective is to promote and release the works of new Country Western singers under a standard contract. Our goal is to allow new Country Western performers an avenue in which they may display their talents and materials. ©Smiley Burnette Interprises is in affiliation with RanchORecords®. 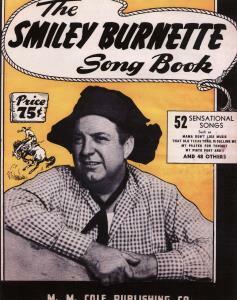 Smiley Burnette wrote well over 300 songs. He performed many of his own works in the films that he made. If you are lucky enough to have any of the Durango Kid series in particular, you will be treated to Smiley’s performance of quite a few of his own songs. You might be surprised at the breadth of his works. 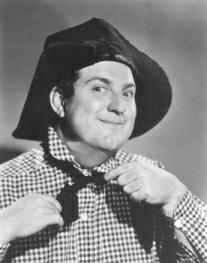 Smiley is most remembered for his children, and humorous type songs. He also wrote beautiful ballads, with wonderful word phasing; enabling a picture to be painted within your mind. 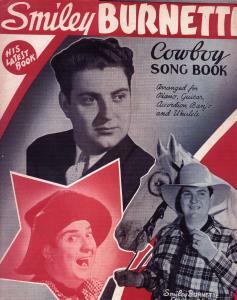 Examples of these songs are: "The Wind Sings a Cowboy Song", "Ridin' Down the Canyon", "God Loves Tennessee", and "Lilac Lane". 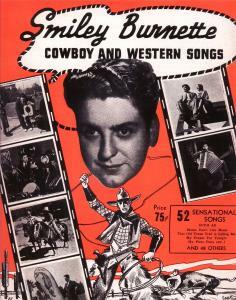 As if Smiley wasn't busy enough starring in the Durango Kid films during the mid to late 1940's, he also hosted his own radio show called "The Smiley Burnette Show". It was recorded on large transcription records, which were used in the same manner we use cassette tapes and CD's today. The transcription records were sent to the radio stations to be placed on the airwaves. Smiley produced and transcribed his radio show under the "RadiOzark" recording label. Displayed is the Record Label from one of these Transcription Records. We invite you to look through a partial listing of songs written by Smiley. You may find pleasure in an era gone by. All for your listening and viewing pleasure!